Every morning when I come to work, the best thing to greet me on the desktop screen is a piece of 3-inch square paper which is yellow in color and the message conveyed in it would make me either smile or frown for the rest of the morning. You have guessed it right. It is the playful and user friendly Post-it note. I am sure of the fact that each one of us likes to use it when messages need to be passed on for immediate action by the receiver or appreciate someone or show gratitude and the list goes on and on. Now they are replicated even in computers, mobiles to name a few. Why was there a need for the computerized version of such stationery when we have the Microsoft Office suite in every computer? Post-its no doubt have its following. In fact, all of us have a story to narrate on the use of Post-it note which takes you down the memory lane. I always wished to use Post-its in my presentations at work which would highlight key points, or build a story line if a couple of Post-its were placed together or draw miniature diagrams for better visual appeal. It seemed to be a long wait till I discovered Raptivity. Raptivity Standard Pack 4 has an interaction model called ‘Sticky Note’ which serves as a unique way to display information in a short, snappy manner for presentations. This interaction model has a lot many features which could be best understood visually. The below Figure 1 is a working example of Sticky Note interactivity. The above Figure is an interactive presentation on the Launch of a Lifestyle Magazine where the Post-it notes are used to add bullet points, notes and diagrams on individual post-its. They are also arranged in a sequence of importance. The key points on the post-its are highlighted which are embossed with different keywords such as 'Brief', 'Highlights'. The Note Pin on each post-it also conveys the items to be taken care for a successful launch of the magazine. This interaction model can be customized easily as per the user’s preference. I could not have asked for more. Have you used sticky notes in your presentations? If not then it’s time to use it and get your audience glued to them. 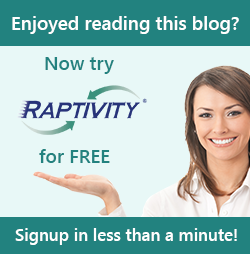 Take the free trial to try them out yourself with Raptivity Standard Pack 4.